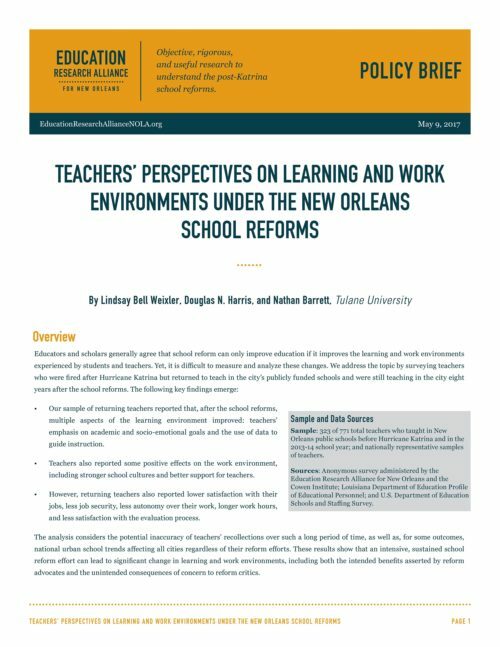 A policy brief and technical report by Lindsay Bell Weixler, Douglas N. Harris, and Nathan Barrett on teachers’ perceptions of how learning and work environments changed in New Orleans publicly funded schools after Hurricane Katrina. Our sample of returning teachers reported that, after the school reforms, multiple aspects of the learning environment improved: teachers’ emphasis on academic and socio-emotional goals and the use of data to guide instruction. Teachers also reported some positive effects on the work environment, including stronger school cultures and better support for teachers. However, returning teachers also reported lower satisfaction with their jobs, less job security, less autonomy over their work, longer work hours, and less satisfaction with the evaluation process. The analysis considers the potential inaccuracy of teachers’ recollections over such a long period of time, as well as, for some outcomes, national urban school trends affecting all cities regardless of their reform efforts. These results show that an intensive, sustained school reform effort can lead to significant change in learning and work environments, including both the intended benefits asserted by reform advocates and the unintended consequences of concern to reform critics.